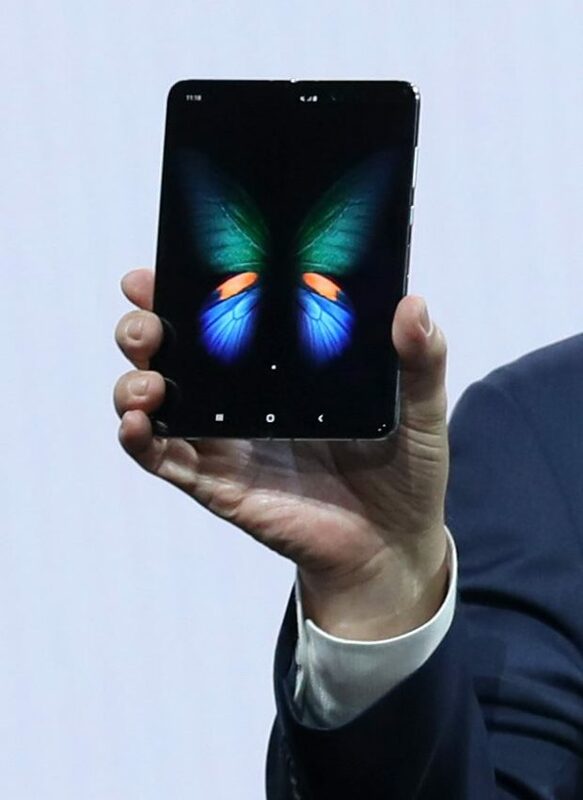 SAN FRANCISCO, CALIFORNIA – FEBRUARY 20: Samsung’s Mobile Division President and CEO DJ Koh holds the new Samsung Galaxy Fold smartphone during the Samsung Unpacked event on February 20, 2019 in San Francisco, California. Samsung’s Galaxy Fold goes on sale in the U.S. at the hefty price tag of US$1,980 on April 26. The phone will be available through U.S. carriers, such as AT&T and T-Mobile, as well as electronics stores Best Buy and Samsung Store. The company will also open preorder reservations for the foldable phone in Europe on April 26, with an official release date set for May 3. Galaxy Fold will be launched in a 5G-only model in South Korea in mid-May, and it is expected to cost around 2.4 million won ($2,100), according to industry officials. Samsung said earlier it aims to sell over 1 million foldable devices in the global market this year. The tech giant has expressed hope that the foldable device and its new smartphone strategy will boost sales in the high-end segment in the face of toughening global competition and the saturated smartphone demand. Samsung, the world’s largest smartphone maker by market share, changed its strategy this year to launch a wider range of flagship phones to cater to various consumer needs. Unlike the previous lineup composed of two variants, Samsung’s latest flagship, the Galaxy S10 series, consists of three phones — S10, S10 Plus and S10e — which performed better than its predecessors upon their debut in the U.S. The new S10 series sold 16 percent more in the first week of its U.S. sales compared with last year’s sales of the S9 series, according to Counterpoint, which tracks new weekly smartphone models in the U.S. market. “It is the additional S10e volumes that helped Samsung get the gains compared to the S9 series sales,” Counterpoint said in a release. “Our data reveals that the combined sales of the S10 Plus and the S10 are similar to that of the S9 Plus and the S9.” Counterpoint Research predicted the S10 series to be on track to ship 40 million units in 2019 as it faces less competition than last year.